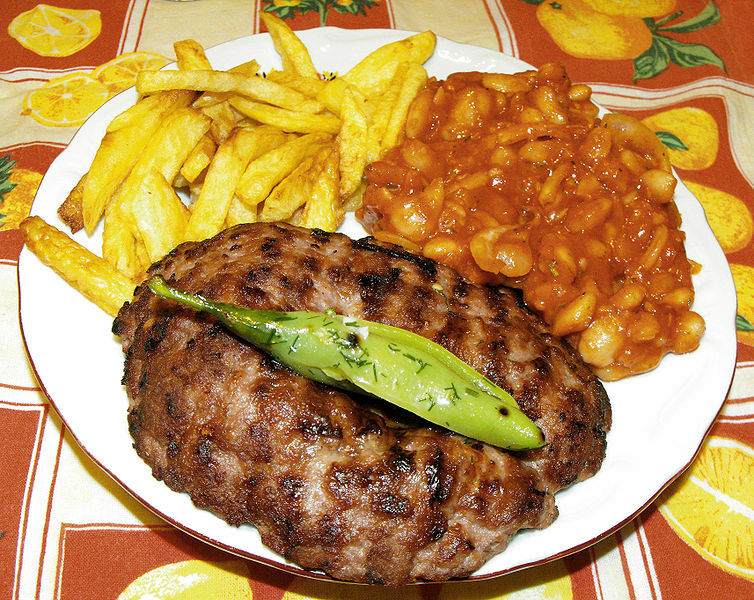 Pljeskavica (Serbian: Пљескавица) is a patty dish popular in Balkan region of Southeastern Europe. Pljeskavica is eaten in Serbia, Bosnia, Montenegro and Macedonia and can be found in Romania, and Bulgaria. Traditional pljeskavica is made from lamb or beef, grilled with onions and served hot on fresh somun (flatbread) or with a thick pita bread. Recently, pljeskavica has gained popularity in Europe and is served in few speciality fast food restaurants in Germany and Austria. It is often served with kajmak (a type of clotted cream) or ajvar (relish made principally from red bell peppers, with eggplant, garlic and chili pepper) and sometimes urnebes (a type of salad characteristic of Serbian cuisine). Leskovačka pljeskavica (pljeskavica from Leskovac) is one of the most famous types in Serbia and is usually made of beef or pork, very spiced and served with onions. There are however, many other ways of serving it such as Šarska and Hajdučka. Šarska pleskavica is made of beef and stuffed with kashkaval (a type of yellow sheep milk cheese). Hajdučka pljeskavica is made of beef mixed with smoked pork meat.